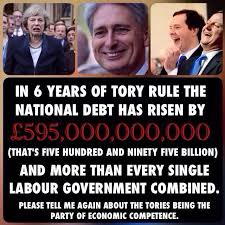 Quite why Labour let them get away with it, I do not know, but the Tories, since the recession of 2008, have managed to paint Labour as reckless in economic matters, and themselves as the only party to be trusted with running the UK’s finances. Ably aided and abetted I might add, by the Lib Dems when in coalition government with the Tories. But let us take a look at the reality of the situation. The 2008 recession was not caused by the Labour government, although they were happy to deregulate the banking industry, which certainly contributed to it, but they were not alone there, with governments around the world doing likewise. It beggars belief that the Tories would have done anything different on that score, and were indeed constantly calling for less regulation. The central theme of the coalition and then fully Tory government has been to cut the budget deficit, by slashing spending on public services, causing much pain to those who rely on these services along the way. The budget deficit is the amount of money that the government spends, less the amount of taxation they receive. 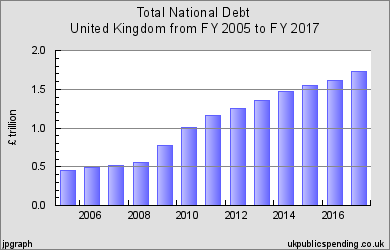 Put another way, it’s how much government debt is increasing each year, excluding interest payments. In 2010 with the economy showing signs of a fragile recovery, this deficit was £103 billion. The original Tory plan was to balance the books by 2015, but this failed to materialise, and instead the deficit was almost halved. Today the deficit stands at £15 billion, but the Tory government has set no target date for it to be eliminated. 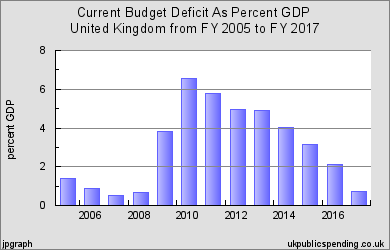 The deficit has fallen from 9.9% of GDP to 3.8% between 2009/10 and 2015/16. GDP of course tanked in 2008, and had recovered a little by 2010. You could, and the Tories do, sell this as steady progress, if not all that was originally promised. But this is not the whole story, and seldom gets mentioned by the main stream media, but in the same period the UK’s debt has mushroomed from 40% of GDP to 88% of GDP and now stands at over £1.7 trillion and is rising. Does this look like any kind of success to you? What happen was that the Tories took a slowly recovering economy and drove it into a ditch, by the simple-minded tactic of slashing public spending, and raising VAT, which reduced growth in the economy and in so doing, made it harder to pay off the nation’s debt. After two years of this, the Tories reduced the amount of public spending cuts to roughly the level that Labour had planned in their 2010 election manifesto. You can see from the above graph that the budget deficit started to reduce more quickly after adopting Labour’s plan, and in effect they wasted three years, whilst causing all kinds of misery to the least wealthy people in the country, and giving tax breaks to the wealthy. An economy that is performing well below historical standards, public services on the brink of collapse, with wages stagnating, whilst prices are rising, is nothing to be proud of. But the government’s narrative all along is of ‘strong and stable,’ 'Labour’s black hole in their budget,’ ‘spending plan simply doesn’t add up,’ to take a few examples. As opposed to the Tories courageously cutting the deficit inherited from wasteful Labour. No mention of the more than doubling of the national debt in their period in office though. They were so confident of their public image for economic competence that they didn’t even bother to cost their manifesto this election, unlike Labour. Where we found the back of a fag packet policy of paying for adult social care, which suggested a floor of £100,000 on a person’s assets including their home. Four days later there was also a cap to limit the amount that can be charged to people. The amount of the cap has not been specified, so how do the Tories know how much it will raise? So much for the Tories economic and financial competence, then. When the campaign resumes again after the suspension following the terrorist atrocity in Manchester, we will hear a lot about how you can’t trust Labour with the nation’s finances from the Tories. But the truth is, that their record is an extremely poor one.